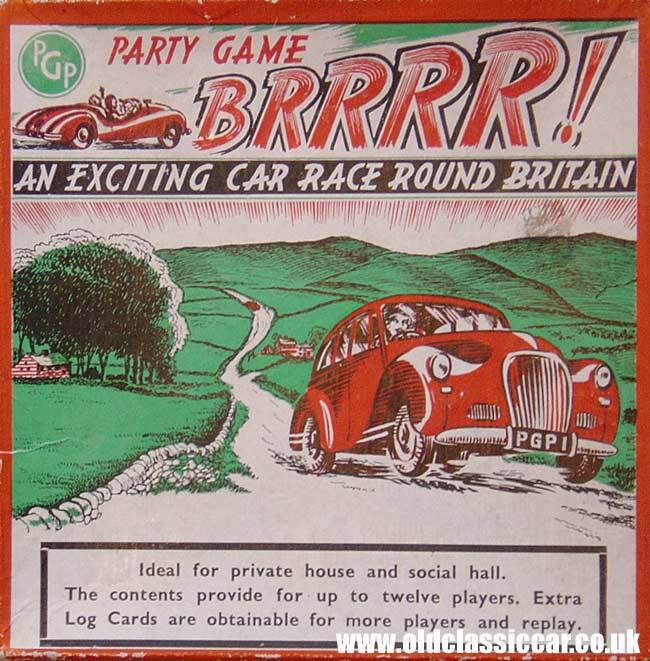 BRRRR - "An exciting car race round Britain". This is one of several old motoring games that feature in the car games & puzzles section of oldclassiccar. BRRRR! was designed by PGP (Party Games Publishers) of Luton in Bedfordshire, one of 50+ party games they produced. It came in a smart presentation box, with the illustration featured on this page, showing a speeding motor-car driven by a young lady, zipping down the leafy lanes of Britain. Pin the 9 Place Cards on the walls of the house or hall or distribute them about the garden at suitable distances apart depending on the area available for play. Give each player a Log Card which it will be noted bears the name of a car. Explain that they must use the side marked 1st Race. Ensure that each player has a pencil. At the word Go each player sets out to find in the left column of a Place Card the name of the place printed on the first line of his Log Card. He then copies in the Speed Column the speed printed on the Place Card alongside the place name. He also writes on the next line the name of the place printed on the right of the Place Card next to the speed figure. He then proceeds to find the latter place name in the left column of a Place Card and enters up his Log Card as before. He continues entering up the card until he reaches London which is the last place on his journey. The players try to complete the journey as quickly as possible, filling in the Log Card as described above. The winner is the player who is first to hand to the M.C. a correctly completed Log Card. The Log Cards are printed on the reverse side for a second race. Twelve Log Cards are provided for twelve players. If more are taking part extra Log Cards should be obtained. The game can be played over and over again. New Log Cards will of course be needed and they are supplied in packets of 12. I have a feeling that actually playing the game would make these rules all the more obvious, whereas if I just read them without playing, I'm a little bemused by it. The box cover suggests that the game is 'ideal for private house and social hall' so they were keen to emphasise that a good number of players could take part. With a bit of luck I'll feature some other games on the website shortly!